For many years, Sune Moberg and his popular Ponnyexpressen have pleased many people in Skåne, in the south of Sweden! At numerous occasions, he has participated with his four-in-hand team at weddings, graduations and childrens parties, or any other event that he has been invited to highlight! Sune is a very skilled carter and can present a pair, a trojka (three) or four-in-hand. The following stallions have been included in his team: Furunäs Fitzroy, Furunäs Geronimo, Furunäs Gregory and Furunäs Irokes. Unfortunately Fitzroy passed away some time ago but has now been replaced by Furunäs Monsun. When Sune chose to reduce his horse activities we were very pleased that a young man named Anton Lundström would get the opportunity to take over Ponnyexpressen. Anton works at Berga Naturbruk and has trained horse and carriage (single and two-in-hand) for many year. His dream has always been to have a four-in-hand team. We wish Anton all the best with the boys and look forward to reading about them and seeing them participate in competitions in the future! We are so happy for Anton that he and Ponnyexpressen have been invited to Stockholm International Horse Show in Globen (26-28 November 2010) to compete in four-in-hand against the very skilled and experienced Tomas Eriksson! We wish Anton and the boys the best of luck and we will be there and cheer for them! Anton Lundström and Ponnyexpressen in full action! 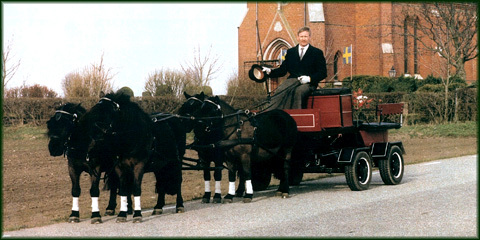 Fredrik Rahm has for several years been very successful when competing in four-in-hand driving with Shetland ponies under the name Team Skäpperöd. Since a couple of years back, he has been using Furunäs Ikaros, Furunäs Jersey Joe and Furunäs Keno in the team. 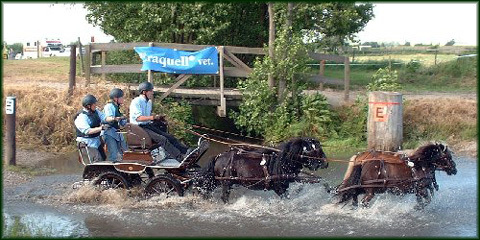 Team Skäpperöd became part of the Swedish national team in four-in-hand driving in 2003 and was selected to participate in the first World Championship for ponies in Austria in August that year. In the last minute, however, the rules were changed so that the minimum age for the participating ponies was increased from 5 to 6 years. Since Furunäs Keno was only 5 years old, this meant that Team Skäpperöd unfortunately had to withdraw from the World Championships. They recovered some of the damage, however, when they won the Swedish Championships in four-in-hand driving for ponies in September 2003! They also managed to repeat this succes, when they became Swedish Champions also in 2005! Furunäs Stuteri sponsored Team Skäpperöd during their pursuit for the World Championship. Fredrik has now replaced the shetlandponies with New Forest ponies. We wish him the best of luck in the future and hope he will be equally as successful as he was with the shetland ponies!